For our first assignment in Digital Life we had to copy a master's oil painting but do it digitally. 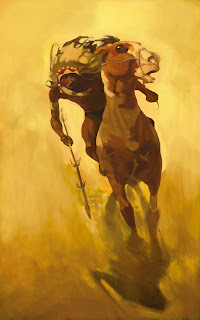 I used a combination of photoshop and corel painter to redo N.C. Wyeth's Indian with Lance. Looks good, especially some of those brush strokes. Looking forward to seeing your midterm and final from this class.